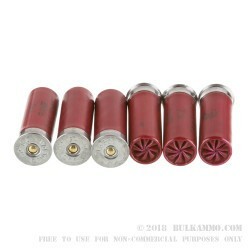 This is the perfect shotgun shell for a small game hunter. It provides the necessary power that will kill anything from rabbits to quail so you’ll be ready to bag your limit when you grab your 12 gauge and take to the woods. 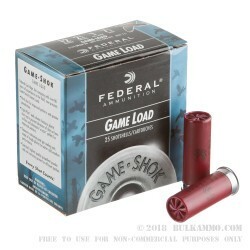 Federal has long been a trusted name in shotgun shell manufacturing and this bullet is another great addition to the Federal line. This is a 2 ¾ round that has a muzzle velocity of 1290 feet per second. Providing you with the right amount of power for all of your small game hunting needs. The Game Shok round offers consistent performance so that you know when you pull the trigger the rounds are going to fire. It also is the perfect round for a variety of situations, everything from squirrel and rabbit hunting to quail and dove hunting, this round will have you covered. Each box comes with 25 rounds and at an affordable price that will keep you shooting longer.